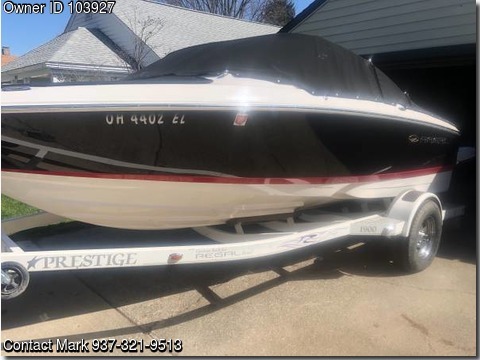 Boat is located in Kettering,Oh.Please contact the owner @ 937-321-9513...Regal I/O boat with matching trailer for sale. Colors (white,black and red trim). White interior with red trim. Working radio with CD player. Volvo Penta engine and prop. Garage kept and winterized every offseason. Will share images of engine hours. There is a swim platform The trailer is custom built for this boat The boat also has snap on covers and a bimini too that are custom for this boat There is a built in cooler under the back bench as well. There will be some accessories included with the sale of the boat such as life jackets swim noodles etc The boat also has walk thru so when coming from the swim platform or to the swim platform you don’t have to climb over the back seat The carpet in the boat is a light grey that snaps in place and can be easily removed for cleaning.